The New World Order unleashed ISIS on the Philippines as punishment for going against the globalist agenda, according to President Rodrigo Duterte, who claims the removal of Rothschild banks from his country was “the tipping point” that triggered the death cult’s invasion. Now the U.S. military have invaded the country, on the pretext of fighting ISIS just like in Syria, but President Duterte, who didn’t invite the U.S. military into the Philippines, is not falling for the lies. “The operation to destroy my beloved Philippines is in full swing,” President Duterte told supporters and injured soldiers. “The infiltration of Daesh, who are now negotiating with opposition groups to form political alliances, is a New World Order tactic you can see all around the world now. The globalists’ unholy war on the Philippines occurred in three clear phases. First, a propaganda war began in the West, with mainstream media outlets smearing Duterte at regular intervals. President Duterte’s harsh words about President Obama were intentionally taken out of context, and the successful operations against terrorist cells and drug traffickers in the Philippines, which was on the verge of becoming a narco state, led to protests of global organizations, human-rights groups as well as several governments including the EU and US. Then the New World Order’s media operation went into full swing. In a few months, using the established techniques of smear and distortion, Duterte went from being an outspoken and unconventional president to being defined by international media as a bloody murderer. This led to President Duterte telling George Soros that he was not welcome in his country, warning the globalist billionaire that “there is a bounty on your head” in the Philippines. 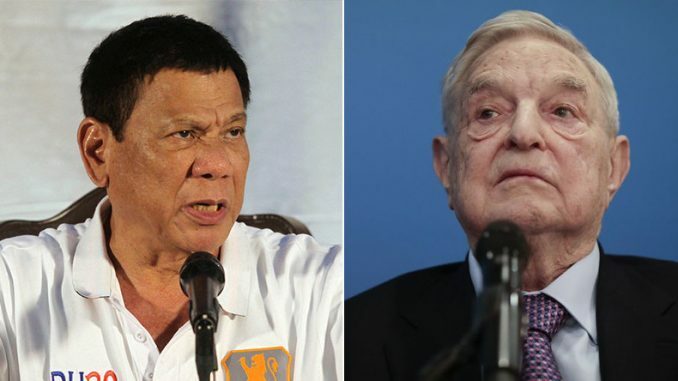 Soros promptly cancelled a proposed “humanitarian visit” to the islands – and shortly after the New World Order has declared war on the Philippines. Now Duterte and his patriots are locked in a vicious battle with ISIS, fighting hand to hand with the jihadis in southern cities, as the New World Order’s hit squad continue their global destabilization project. ISIS fighters, the globalist’s private militia, are now swarming in southern Philippines cities, doing the New World Order’s dirty work, while the U.S. military orchestrates regime change from the wings. Despite the critical state of affairs, Western media continue to attack Duterte. Rather than informing their audience about the president’s brave efforts to protect his people against the rampaging death cult, Western liberal media is ignoring the real issues and publishing vile and misleading hit pieces. The most prominent story published in Western media about Duterte since the ISIS invasion was a hit piece criticizing the president’s “locker room talk” with members of the armed forces engaged in the battle to save their country. Rather than praise the president for his hands-on role, western media feigned outrage about his “politically incorrect” choice of words. The president has had his reputation attacked relentlessly by mainstream media around the world, despite his sky-high approval ratings at home. Now his country is being physically attacked by globalist-backed radical Islamic terrorists. Backing the president of the Philippines in his fight with ISIS, and rejecting the mainstream media’s deceptions, is the least that patriots and nationalists around the world can do.